You are here: Home / Sports / Fabbri’s hat trick lifts the #STLBlues over the Flyers. Fabbri’s hat trick lifts the #STLBlues over the Flyers. Robby Fabbri got a hat trick with two goals coming in the third period. 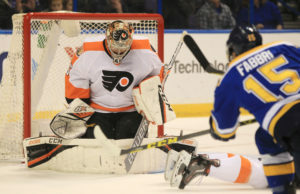 David Perron and Scottie Upshall also scored during St. Louis’ four-goal third period and the Blues handed the Philadelphia Flyers 6-3 lost on Wednesday night at Scottrade Center. Kevin Shattenkirk, playing in his 400th game with the Blues also scored and Carter Hutton made 17 saves. St. Louis improved to 12-1-4 at home. Wayne Simmonds, Nick Cousins and Brayden Schenn scored for the Flyers, who dropped their fourth game in their last five since a recent 10-game winning streak. Steve Mason made 19 saves in the loss. The Blues host Nashville on Friday night, then prepare for the Winter Classic at Busch Stadium on Jan. 2nd against Chicago.